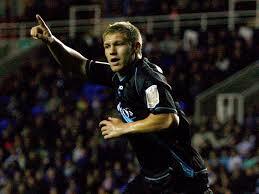 Martyn Waghorn celebrated his permanent contract with his fourth goal in Latics colours. Some say that for teams challenging for promotion at this time of the season it is the points that count, not the entertainment. So it could be said that Wigan Athletic did what was needed by gaining a welcome three points at the expense of visitors Leeds United. Following a run of three league matches without a win, it was important to consolidate a place in the top six. However, entertainment it was not. Uwe Rosler made just two changes from the side that had lined up in midweek against Leicester. Callum McManaman and Martyn Waghorn came in for Jack Collison and Nicky Maynard. In reality there were few moments of good football in this game. Latics appeared tired and were clearly not relishing the task of taking on a very physical Leeds side. Michael Brown typified the visitors’ approach. The 37 year old riled the home crowd with a series of challenges and niggles, reminiscent of his time at Wigan in the Steve Bruce era. He had managed to largely shackle Jordi Gomez until the Spaniard produced Latics only worthy effort on goal in the first 30 minutes, a fine shot from distance curling narrowly wide. Latics were to go ahead in the 33rd minute after James McArthur slalomed around the edge of the area, going down under a Leeds challenge. However, from the loose ball Waghorn scored with a low shot which goalkeeper Jack Butland should have stopped. Ten minutes later, and much to his displeasure, Brown received a yellow card for a foul on Gomez. Latics started the second half with James Perch having a good shot deflected over the top by Stephen Warnock. Latics brought on Collison for Nick Powell after 55 minutes, James McClean for McManaman after 62 minutes and Marc Antoine Fortune for Waghorn on the 68 minute mark. However, the substitutions were to have little effect and the mediocre football continued until the final whistle. The match statistics reflected the way it had gone – Ali Al-Habsi having to make just one save, Butland two. Leeds had committed sixteen fouls, to Latics’ seven. Ironically it was Wigan who received more yellow cards, with three against Leeds’ two. Swelled by the away support, the attendance of 16,443 was the largest at the DW Stadium since the visit of Burnley in December. They deserved better entertainment than this. The three points puts Latics nine points ahead of Bournemouth, Brighton, Ipswich and Nottingham Forest who head the pack just below the play-off spots, all on 58 points. With only six games to go, Wigan are getting closer to securing a top six finish. After the match Rosler admitted his mistake of making only two changes from the lineup that had run themselves into the ground against Leicester. Too many players were clearly not up to it physically. Once again Shaun Maloney was left on the bench, but given the way the skilful Gomez had been treated by the visitors, Rosler was probably right not to bring the Scot on. Leeds showed themselves to be one of those uncompromising physical teams that are scattered around in the Championship division. Were this to have been a Premier League game there would have surely have been oodles of yellow cards issued. Championship referees are clearly more lenient. Ali Al-Habsi: 6 – largely unemployed. James Perch: 5 – has not been at his best recently. Maybe still troubled by injury? Emmerson Boyce: 6 – solid in defence. Ivan Ramis: 6 – ditto. Rob Kiernan: 6 – ditto. Stephen Crainey: 5 – lacks the finesse and vision of Jean Beausejour at wing back, but worked hard. James McArthur: 7 – despite playing an excessive number of games without a break he continues to be a key performer. Let’s hope he can stay fit and sharp for the play-offs, assuming Latics get there. Jordi Gomez: 5 – a marked man, not on top of his game. Callum McManaman: 5 – disappointing. Taken off after 62 minutes. Martyn Waghorn: 6 – celebrated receiving his permanent contract with an opportunist goal. Worked hard as usual. Now has 4 goals and 4 assists in his 10 starts. Taken off after 68 minutes. Nick Powell: 5 – clearly not yet fully match-fit. He will not be able to reach the crowd’s expectations of him until he regains full fitness. Went off after 55 minutes. Jack Collison, James McClean, Marc Antoine Fortune – could not make much impact on the game. Wigan were fortunate that a premiership referee was not in charge of the match as James Perch would have been red carded for the elbow on Warnock & Ramis would have got second yellow for his body check on Poleon in the second half. Thank you both for your contributions!